Now that the NHL All-Star game in Nashville has come and gone, let’s get back to business. The Ducks are two points out of a playoff spot behind the Arizona Coyotes with two games in hand. The Ducks have been hitting their stride in the past few weeks. They have been getting offense from all throughout their lineup. Corey Perry has been Mr Reliable for most of the season and leads the team in goals with 20 and points with 33. Ryan Kesler has been heating up as of late with seven goals and four assists in the last 11 games. He has pretty much doubled his point output over that time. He is sitting on 23 points in 47 games thus far this season. His running mate throughout the season, Jakob Silfverberg, has been hot as well with three goals and eight assists over his last eight games. The second line has finally found its legs. It took a while, but hey… better late than never. The Ducks are trending up and they have been doing so without their number-one defenseman Cam Fowler. Ever since he sprained his knee on Dec. 27, the Ducks have been one of the better teams in the league maintaining a 9-3-1 record. I’m not saying that Fowler was the reason for their early season struggles. They have been getting great goaltending from All-Star rookie John Gibson, air-tight defensive play and offensive contribution from throughout their lineup. 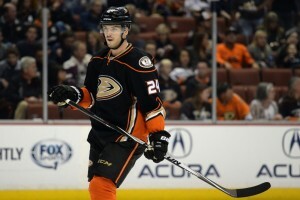 The biggest surprise has been rookie defenseman Shea Theodore. Head coach Bruce Boudreau put him in the lineup when Fowler went down to injury. Since playing his first game against the Flames on Dec. 29, Theodore has provided the Ducks with great mobility from the back-end, the ability to get the puck out of the defensive zone quickly and has even chipped in with some timely offense. His first career point came on Jan. 13 against the Ottawa Senators. It was a game-winning goal. He has two goals and four assists in his last six games and playing on the first power play unit. The question now is to figure what to do when Cam Fowler returns. He is expecting to come back soon after the All-Star break. He will definitely get back into the lineup, but who comes out? 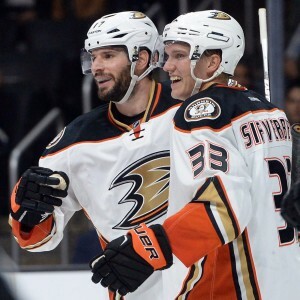 Simon Després took part in his first game in three months last week, played more than 20 minutes and helped the Ducks crush the Bruins 6-2 in Boston. Fowler, Després, Theodore and Lindholm are all left-shooting defensemen. Although he has been filling the scoresheet and playing really well, Theodore is the odd man out just because he has an Entry Level contract which allows the team to send him down to the minors in San Diego without going through waivers. He has even played a game with the Gulls during the All-Star break where they lost 2-0 to the Ontario Reign (Kings AHL affiliate). As long as Fowler is out of the lineup, expect Theodore to take his place. Fun’s Over. Back to Business. There are 14 games this month, which is the amount of games before the trade deadline on Feb. 29. The Ducks have eight games on the road, including a seven-game road trip which begins on Feb. 8 in Pittsburgh and ends on Feb. 18 in Vancouver. The Ducks finish the month with four home games. The push for the playoffs continues Tuesday. We need you to get loud @HondaCenter!